The initial observation of this thread is a great question, but still unanswered - What is the identification of the plant appearing behind the Oswald figure? What is the plant's normal cycle of foliage, and can a time of year be established based on observation of the foliage. The November 29, 1963 photo shows a fair amount of difference in the plant's appearance from the BYP. The 1967 photo is less useful as it cannot be determined if any pruning work etc had occurred over that time. "Is there anyway possible, with techniques utilised in the 60s, that a human body with shadows were superimposed over a photograph of the backyard at Neely St?" Thanks Jeff, yes, I was looking at the Nov 29th photo and noticed the shrub growth in comparison to the BYPs. The question is whether that represents 2 months growth from a possible September photograph. I also picked up on the "geographic features discernible within the shadows" without referring to any reports and that is one of my concerns. I know it can be done today using photoshop whereby you fade in an image over the top of another without total loss of the underlying image. Yes, Photoshop is rather straightforward, but having that measure of control over opacity in a darkroom is very difficult, compounded by the requirement of varying the adjustment between the Oswald figure and the shadows. I had to go crazy with the contrast to match the Oswald BYP. Was there something wrong with the Imperial Reflex camera? I think the body shadow over the grass was impossible then. Maybe they could alter an existing photo with Oswald's face. The problem is, he is leaning too far in 133a yet the shadow corresponds. If they can't fake the shadow it has to be from a photo taken a 1/2 hour earlier and they leaned a cut and paste of the body, Maybe Roscoe, to match the shadow. But then the shadow would be about 7 inches shorter from the elevation change in that 1/2 hour. I gets tricky. No, like when I correct you, John. I was pointing out the fallacy of David's argument about the shadow of the stair post. My only intention is to correct incorrect information, unlike you. What do you disagree with over my shadow comments? The “cutout” had been made by Dallas police officer Bobby Brown, who claims it was done at the direction of the Secret Service several days after the assassination. Brown offers an innocent explanation, claiming that the Secret Service wanted a reenactment of the backyard photos to demonstrate where an how they had been made. He says that Forrest Sorrels of the Dallas Secret Service had called Captain Fritz and requested that someone from the Crime Lab go to the Neely residence. Brown and Fritz, together with some Dallas detectives and a couple of Secret Service agents, went to the house and made the photos. Brown was selected to pose because he was the youngest of the men present He was given a rifle that Fritz had in his car and the Secret Service instructed him which hand should hold the rifle, how he should stand, how he was to hold the newspapers, etc. Brown claims that he later cut his figure from the photo because he did not want to be identified with it. I asked Bobby very specifically what would possess him to cut out his silhouette from the reenacted photographs. He was adamant to me that he only wanted to take himself out of the photograph since it was the background that was the subject, and not himself. He said that he did this entirely on his own, and that no one told him to do so. He said he cut his image out of a developed photograph and placed a white piece of paper behind it and re-photographed the reenactment. Brown later offered another version of how the ghost photo was made, this time with Oswald being cut out of the picture. He says that, after he posed for the reenactment, the FBI brought the 133-C photo to him at the Dallas crime lab and Brown cut Oswald out of the picture. He then photographed the 133-C print against a white background to make the matte. This matted photograph, one of two photos showing the same “ghost” against two slightly different backgrounds, which was discovered by Mary La Fontaine in the Dallas Police files, combines a silhouette of Lee Harvey Oswald taken from 133-C with the backyard at 214 Neely Street as it appeared on Friday, November 29. Although the Secret Service and Dallas Police obviously had a copy of 133-C at the time of the reenactment, the photo disappeared from 1963 to 1975, only to turn up when produced by none other than the widow of Dallas Police Officer Roscoe White. Anyone care to make a comment on the accuracy of these statements from years ago. Is there any new information? 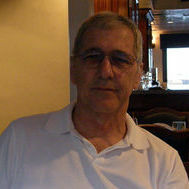 I have tried to date the BYPs shown in the photo below based on the previous post. I am not certain that my arrangement of the photos is correct based on the dates and the scenes in these photos. My arrangement of the photos is based on the shrubs shown and the dates shown in the previous posts. In my opinion the dates and the growth of the shrubs don't match. 1. In the 1963 photo and the 1967 CBS repro there is no dead shrub or un-foliated shrub in front of the steps post. In the 1963 Dallas Police photos there is a shrub there in front of the steps post. 2. The shrub behind the figures appear to be larger and therefore older then the shrub in the 1963 and 1967 photos. 3. 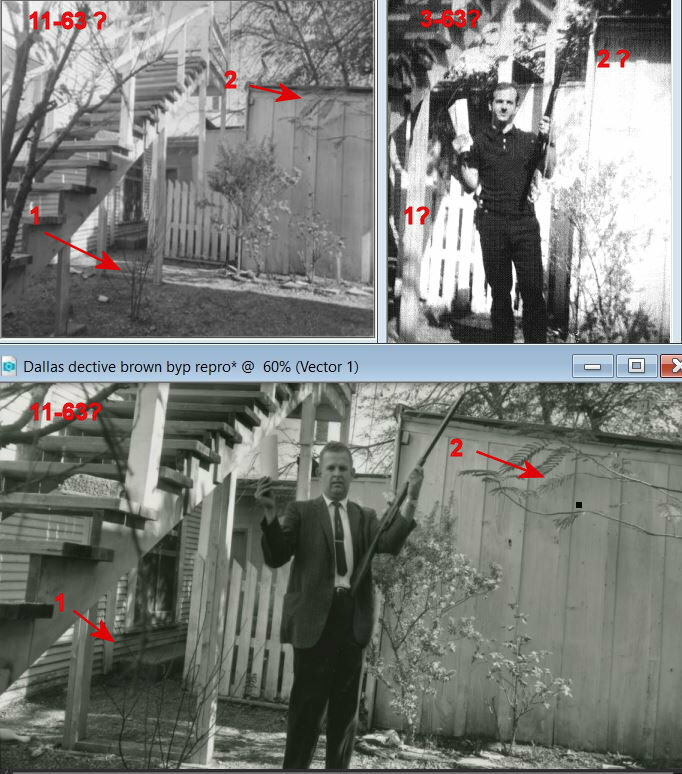 The photo of Detective Brown in Nov. 1963 appears to have the shrub behind him smaller than the one with the ghost photo supposedly done at the same time. Pruning on the same day you think? 4. The Nov. 29, Dallas Police Det. 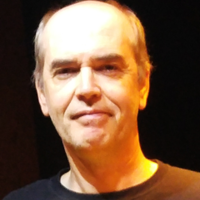 Brown photo has a foliated shrub behind him. The CBS March, 1967 photo has no foliage. This confirms the notion that the BYPs if taken in March should have no foliage for that shrub. These photos were taken in different years. The growth in the photos are not the same. 1 and 2 are missing in 133-C.
You need to take your phone outside and photograph the shadows from vertical lines looking into and away from the sun. Like I did. Do the experiment or withdraw your criticism of Ray, because he's correct. The visual phenomena is known as 1 point perspective, and it can be replicated. So do some work. The claims by DPD officer Bobby Brown were made many years after the fact. There is no information to contradict what he says, but there is also no information to corroborate what he says. That BYP 133-C was known to members of the DPD, the Secret Service, and the FBI a week after the assassination is confirmed by its use in the Nov 29 reenactment. It’s not clear why Brown would feel he needed to cut his image out from a print copy of the reenactment, or why the FBI would instruct him to do the same with the Oswald figure. His work was done with prints of the photos, and so had no permanent effect on the integrity of, for instance, the negative or remaining first gen copies. I am not sure what you are getting at with the arrangement of four versions of the backyard: the 1967 photo is an outlier as three years or more had passed, and therefore no comparative information of the state of the backyard is useful. The other three photos can all be traced to 1963, and two of them can be dated to Nov 29, 1963. It is the most well-known and widely circulated photos, with the Oswald figure, which is in question, and what can be said is it appears to be taken some months earlier than Nov 1963, that the official story says it was taken in March, while speculation of a doctored photo tends to situate the creation in September. Although the Secret Service and Dallas Police obviously had a copy of 133-C at the time of the reenactment, the photo disappeared from 1963 to 1975, only to turn up when produced by none other than the widow of Dallas Police Officer Roscoe White. It would be interesting to learn which one of the three photographs (A, B, or C) were shown to Oswald four hours before they were officially found and brought back to police headquarters. You can also read a copy of Fritz's notes of his interrogation of Oswald that Saturday afternoon in CD 81b, page 460, although these are hard to make out. 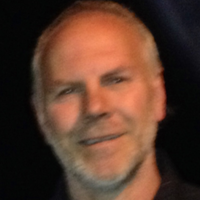 Michael Paine said he talked to the Dallas Police about Neely St. on Friday evening. Now, Kelley says that the 12:35 Interview mainly consisted of questioning Oswald about where the bulk of his belongings were stored, and he says that immediately after the Interview was terminated at 1:10 PM, officers were dispatched to the Irving residence to conduct a further search. My problem here is that Rose, Stovall and Adamcik say that they were dispatched to Irving at 12:00, and got a search warrant from a judge in Oak Cliff at 12:30. 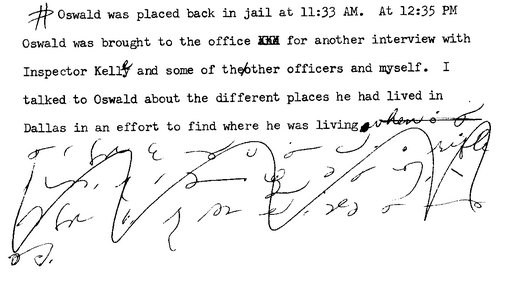 This is even before Oswald was brought back down from jail at 12:35. They arrived at Irving at about 1:00, just about the time Oswald's interview was ending. My hunch is that it was 133-C that was shown to Oswald - the one that stayed hidden for so many years. "I am not sure what you are getting at with the arrangement of four versions of the backyard: the 1967 photo is an outlier as three years or more had passed, and therefore no comparative information of the state of the backyard is useful. The other three photos can all be traced to 1963, and two of them can be dated to Nov 29, 1963. It is the most well-known and widely circulated photos, with the Oswald figure, which is in question, and what can be said is it appears to be taken some months earlier than Nov 1963, that the official story says it was taken in March, while speculation of a doctored photo tends to situate the creation in September." I arranged the photos that way because the trunk and limbs of the shrub in the 11-63? Oswald cut out photo appear to be bigger or more robust than 133-C shrub. According to the info only two months have passed. That is if you believe the photo in question was taken in Sept. rather than March. Also there are other shrubs and tree lines in the photo that are not in 133-C and the 1967 CBS reproduction photo. This is mentioned in one of the earlier posts. If the 11-29 photos were truly taken before the 1967 CBS photo and 133-C then those bits of foliage should have been in them. What I am attempting to show is that the photos labelled 11-63? might be taken at a later time than 11-29-63. In 133-C and the CBS photo we do not see that shrub in front of the steps support or the tree branch protruding into the other photos. This suggest a later date for those photos labelled 11-63?.